Basidiomes of the cone-inhabiting Auriscalpium species, usually regarded as A. vulgare Gray, are widely distributed across the Northern Hemisphere and easily recognized because of their unique macro-morphology. However, phylogenetic diversity patterns among different geographic populations and different substrates are completely unknown. In this study, samples of A. vulgare s.l. in different areas of China were studied phylogenetically, morphologically, and ecologically. For comparison, European collections of A. vulgare were included. Our phylogenetic analyses, inferred from partial nucleotide sequences including the internal transcribed spacers (ITS) 1 and 2 with the 5.8S nrDNA, the large subunit of nuclear ribosomal RNA (nrLSU), and the region between the conserved domain 6 and 7 of the gene for the second largest subunit of RNA polymerase II (RPB2), indicated that three phylogenetic species can be recognized, which correspond well with morphological and ecological evidence. Therefore, three species, having distinct substrate preferences, are documented here, namely the well-known A. vulgare, and the newly described species A. orientale and A. microsporum. Auriscalpium vulgare is widely distributed throughout the northern temperate Eurasia and North America, while the new species have been known mainly from subtropical East Asia and northeastern India to date. 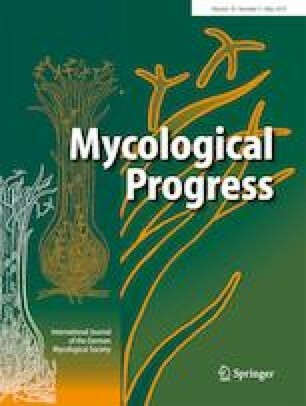 This article is part of the Topic collection on Basidiomycote Mycology in honour of Franz Oberwinkler who passed away in March 2018. The online version of this article ( https://doi.org/10.1007/s11557-019-01477-3) contains supplementary material, which is available to authorized users. We are grateful to Dr. Walter Till (Curator of University of Vienna Herbarium, WU) for sending us specimens of Auriscalpium vulgare on loan. We are very grateful to Drs. Hong Luo, Feng Bang, Gang Wu, Qing Cai, Jiao Qin, Qi Zhao, Yan Chun Li, Yan Jia Hao, Mr. Xiao Bin Liu, and Mr. Jian Wei Liu (Kunming Institute of Botany, KIB), Dr. Xue Tai Zhu (Northwest Normal University), and Dr. Li Ping Tang (Kunming Medical University) for providing us samples. We especially thank Drs. Gang Wu and Jiao Qin (KIB) for their constructive and illuminating comments, criticisms and suggestions. This work was supported by the Strategic Priority Research Program of the Chinese Academy of Sciences (XDB31010000).